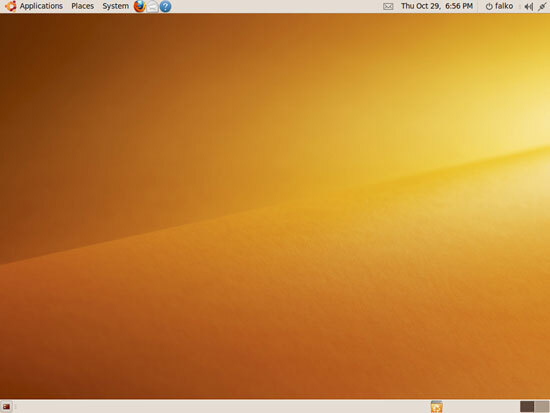 Yesterday the new Ubuntu 9.10 (Karmic Koala) was released. 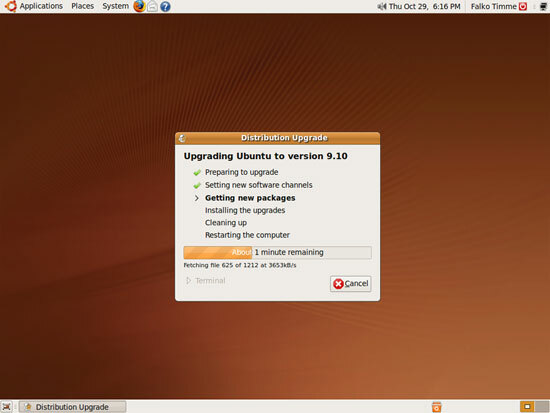 This guide shows how you can upgrade your Ubuntu 9.04 desktop and server installations to Ubuntu 9.10. 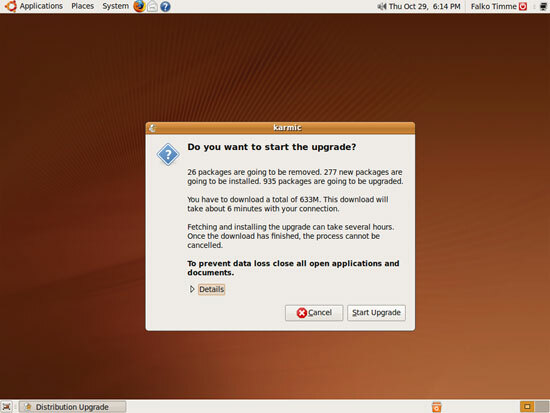 The upgrade tool is now being downloaded. installed. 269 packages are going to be upgraded. 18 packages are going to be removed. 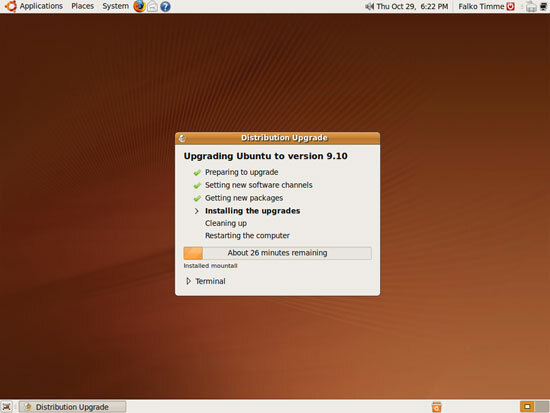 After the reboot, your server is running Ubuntu 9.10. 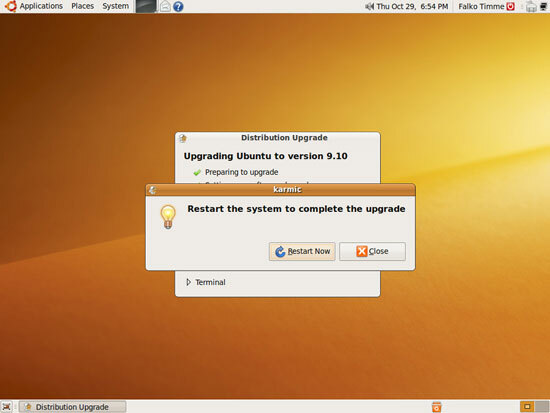 I upgraded my ubuntu laptop with little difficulty - the difficulty being in the network, probably because I tried to upgrade on the same day the distro was released. 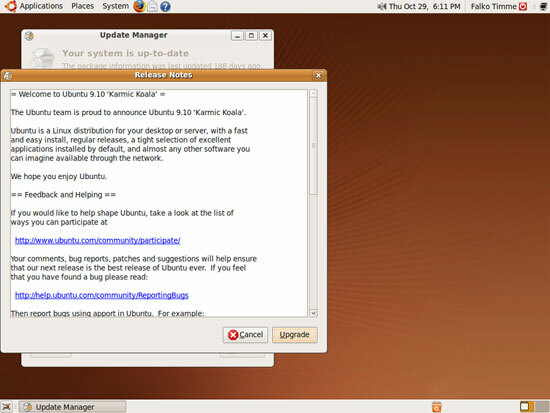 nothing to do with the distro itself. On Kubuntu desktop, I get a "9.10 available" notification and I have to just click the button! I just updated my Vostro 1500... Already reported two errors via launchpad (wifi radar and a kernel panic). I was upgrading from jaunty to karmic when my computer crashed. when i restarted it won't reboot apparently because the upgrade got aborted. how do i get back what i had? i don't mind going back to jaunty as long as i get it working. please help me. update-alternatives: error: alternative link /usr/share/man/man5/maildir.5.gz is already managed by maildir.5.gz. You won't loose any configurations mail accounts etc. I made the mistake of looking at the details of the obsolete software packages that were going to be removed, this stopped the install script and the packages were not removed. 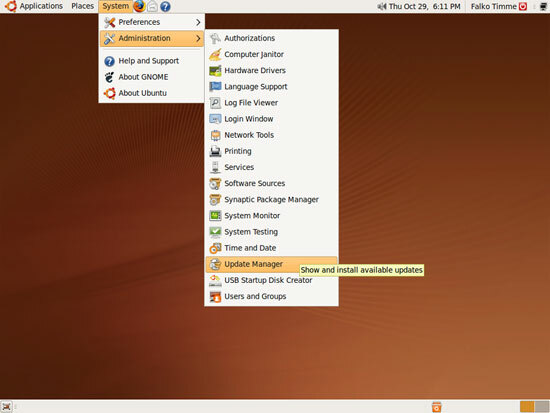 grub2 has been completely rewritten for "modularity & portability". Grub 1.5 is deprecated. The current drive has been upgrade from 7.10 to 8.04 to 8.10 and now to 9.10 (Yeah, I skipped 9.04, sue me). 1784 packages were upgraded, it took overnight, I lost a couple of things I used: buoh, the gnome comic reader and pysol, a solitare game I fancy. Both of these can be added from previous repositories or from the source. BEFORE you wipe your drive. Also make a note of your other sources (do-core for instance) so you can add that as well before you go on the apt-install trail as well as any custom configurations, such as maybe your xorg.conf or mail servers. 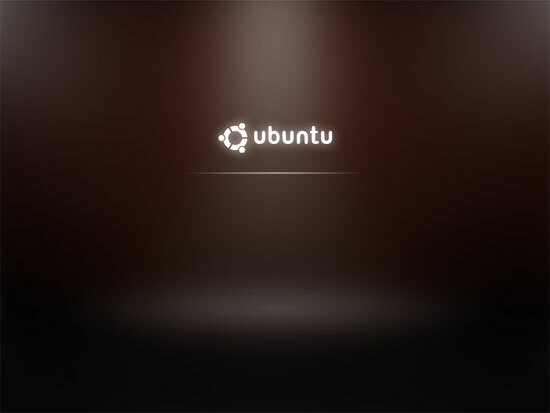 If you don't maintain your /home directories on a separate drive or partition, with ubuntu it's easy, lot's of tutorials out there on how to do so. 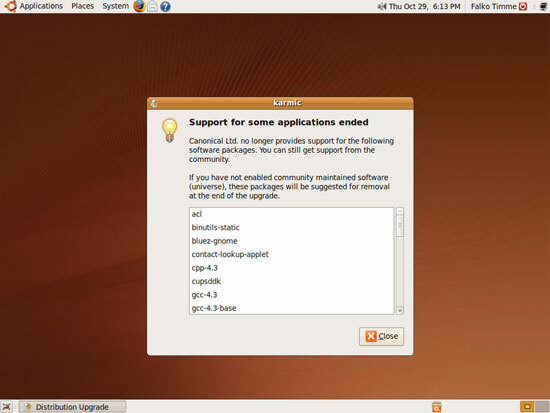 The Ubuntu forums have some ideas to fix it but they involve updating to the latest SVN build of handbrake that has dropped support for xvid/avi which was all I used it for :(. I had a good 9.04 working on my amd64/1G/nvidia ge6 /realtek sound card. When I upgraded, it went on smoothly, but after the upgrade completed, the sound card was lost and not recognized anymore. And the boot time was about 50 seconds. So I had to reload by a fresh installation - and the sound card was recognized but as a pulse audio, not as realtek in the previous 9.04. The microphone doesn't work anymore in 9.10. I've got loads of work to make them work. The boot time is now 35 seconds.